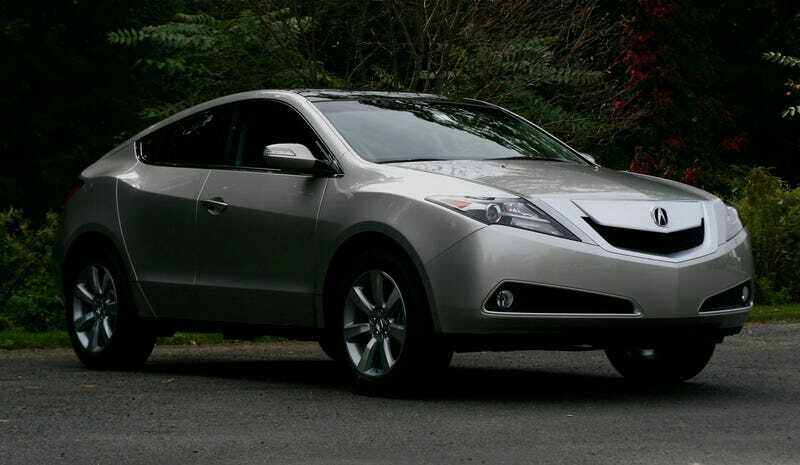 The new Acura ZDX has a distinctive exterior, a sumptuous interior and both are strangely proportioned. So who, exactly, does Acura think is going to buy this thing? In a word: DINKs. No, not dorks or dweebs, although there may be some who overlap into this bracket. We're talking DINKs, as in the acronym for Double Income No Kids. Your DINKs are people for whom no one else exists save that one significant other; couples with grown children or no plans to have children. This immediately distances the ZDX's mission from that of the soccer-mom and grocery-hauler SUVs. Acura's core concept for the ZDX was the "Passionate Getaway," meaning the car would be both vehicle and destination in itself. As it turns out, as odd-looking as it is outside, it's actually an extremely pleasant car for two people to be inside. The cockpit of this Acura is one of the nicest we've seen, period. It doesn't really break any new ergonomic ground, although everything is right where it should be. What makes it truly stand out is the design, which puts the driver and passenger in comfortable and attractive "pods," and the quality and tactile feel of the surfaces. A lot of time and effort was spent in determining the best materials for surfaces in the ZDX, and it was time well spent. The leather, which Acura selects and applies by hand using techniques developed specifically for this car, is of especially high quality and is a tactile delight. Plastics are few but sturdy and soft-touch where they occur. Nighttime accent lighting gives a nice, subtle blue backlight to your surroundings. It's a great place to spend time with your companion/partner/spouse and your no-kids. Your no-kids will also enjoy the back seat, which is just the right size for nonexistent children. To be fair, existing children will fit back there, but double-income couples with more than two friends, or only two friends who happen to be over five-foot-nine, will need to take another car for longer Passionate Getaways. These seats seem built specifically to fold down, which they do, nice and flat, giving you plenty of room for a double income's worth of active-lifestyle stuff on the cabin floor and in the many cubbies. So you and your co-DINK have no kids and no friends, which means the two of you are splendidly isolated in that extremely nice cabin even before the Passionate Getaway. If that's what you like, the ZDX can give you isolation in spades. The already remarkable sound and vibration insulation is augmented to almost eerie levels by an ingenious, if invisible, active noise cancellation system, in which white noise is piped through Acura's legendary sound system to counteract background noises so you can hear yourself (and possibly one other person) think. That legendary ELS sound system, plus the climate control and optional nav system, are controlled through the nifty "Monolith" center stack, which has no visible lettering on the switches until powered on with each set of switches only powering on when needed. Although not very practical, i's a very striking user interface. Once you can see what's going on, it's easy enough to use, and the familiarity of ownership may have DINKs playing it like a piano, but to the newcomer it may seem somewhat unwieldy. It should, in all fairness, be mentioned that there's also a capable 300 HP 3.7-liter VTEC engine in front of this lovely interior. The ZDX puts that adequate if not exactly stirring power down through a paddle-shift 6-speed auto transmission which will actually shift down two gears with one pull if the revs are available, which is genuinely cool but may be wasted here. The drivetrain incorporates Acura's SH-AWD system with torque vectoring across the rear axle, which should allow DINKs to make their Getaways nice and Passionate in all kinds of weather. And while the ZDX is based on the big MDX platform, lots of careful and clever chassis engineering has been done on this SUV-like but coupe-esque-from-certain-angles vehicle. As a result it can do more than just getting out of its own way, delivering unobtrusive if not inspiring handling while delivering an extremely smooth ride over most surfaces. We're assuming most potential buyers won't care about most of that. They'll care that the ZDX does everything a person, or two persons max, could want it to on a getaway, passionate or otherwise. It has all the connectivity luxury buyers have come to expect, and all the nifty gadgets like adaptive cruise control and ventilated seats are available. From the outside, the wide-haunched and glass-heavy exterior styling which looks good from the rear except for certain viewing angles which look almost Aztek-y, and that Acura grille that always makes us want to open up a really big bottle. But none of that stuff will be important to the DINKs who will be inside, enjoying each other, that marvelous interior, and little else while Passionately Getting Away from everything.